“We’re growing at a sustainable pace,” Pike said, referring to the number of building permits issued by the city during 2017. The city issued 1,800 permits last year, which covers single-family housing, commercial and industrial projects, additions and miscellaneous structures. The total value of those permits is estimated to be $368 million. Washington County overall gained 2,200 new jobs between December 2016 and December 2017, according to the Department of Workforce Services. The construction field created the most new jobs, with hospitality and health care following close behind. Major construction projects of the last two years include new shopping centers, student housing and the continuing $300 million expansion of the Dixie Regional Medical Center. 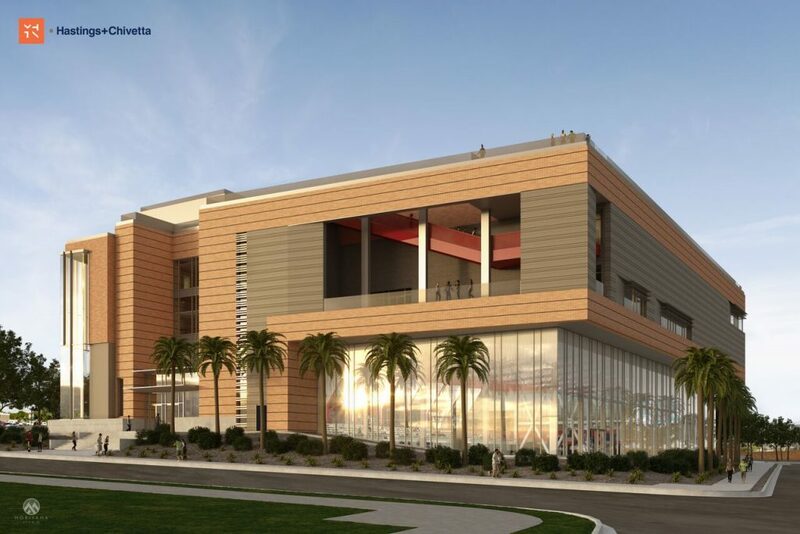 Among the projects carried into 2018 are related to Dixie State University. A student housing complex on Tabernacle Street called “605 Place,” as well as the $55 million Human Performance Center and 5,000-seat structure on the east side of Legend Solar Stadium as a part of the ongoing projects this year. “The Vintage,” another student-housing complex on Tabernacle Street that took shape last year, has been completed and has begun to house students, Pike said. Work on Dixie Regional will start to wind down as the project approaches completion near the end of the year, with new and expanded facilities receiving a grand opening around November or so, Pike said. Other construction projects include housing and mixed-used developments that the mayor said would help with the city’s housing needs. For the last two years, multi-family housing has been beneath 1 percent vacancy in the city, lending to a housing crunch and increasing rental costs. While some of these project are advertised a having high-end apartments with rents to match, Pike said the incoming rental units would help the market catch up with the demand. 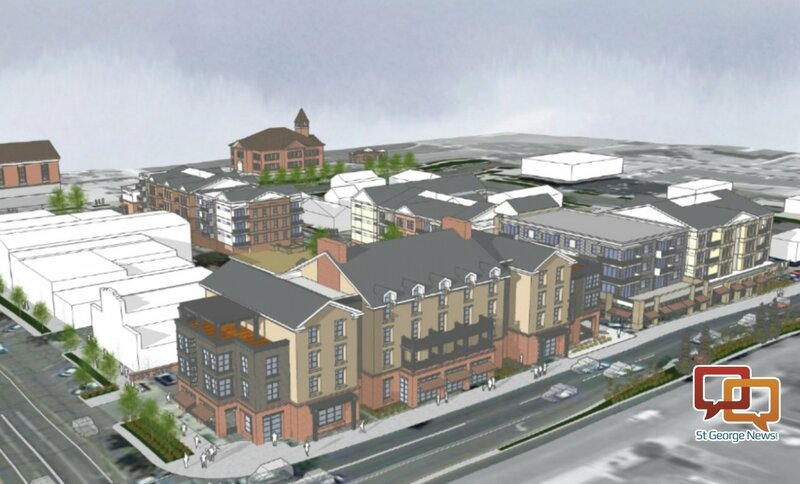 Mixed use projects include City View, which recently broke ground in the heart of downtown St. George, as well the nearby Joule Plaza project that could break ground his year. They both sport a mix of retail space on the bottom level and apartment on the upper floors. The downtown projects are being promoted as supporting a lifestyle that will allow residents to live, work and play in the heart of the city. 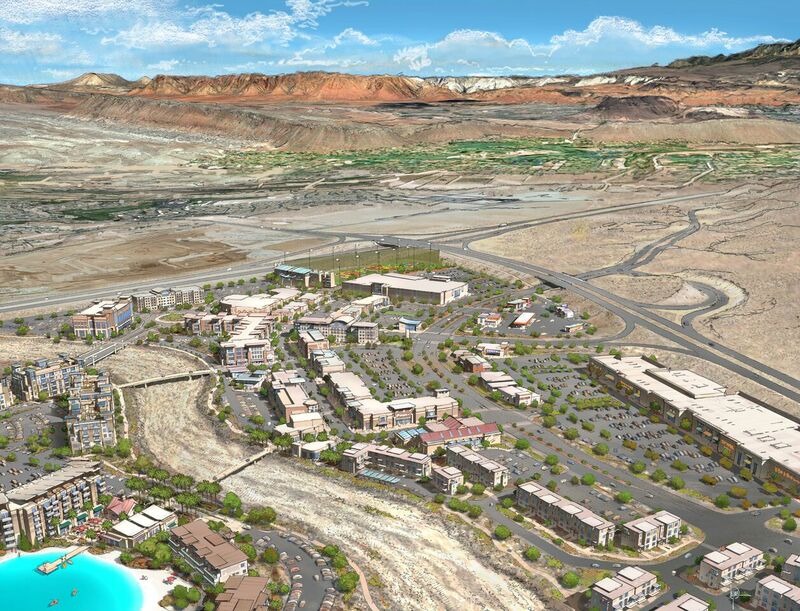 Other incoming apartment complexes Pike spoke of include the Legacy Ridge complex being built on the eastern side of Foremaster Ridge, as well as the Grayhawk complex being built next to the Virgin River near the Smith’s Marketplace off Mall Drive. “Some of this will be coming online this year, some in the year after that,” Pike said. “It’s just a little 3,600-acre development. Nothing to see here,” Pike joked as he spoke of the massive project of about 10,000 new residences. The project is located on the city’s southern edge, along the Utah-Arizona border by Interstate 15 Exit 2 on the east side of the freeway. The area has long been known as the “South Block” and had been pretty quiet until recently. 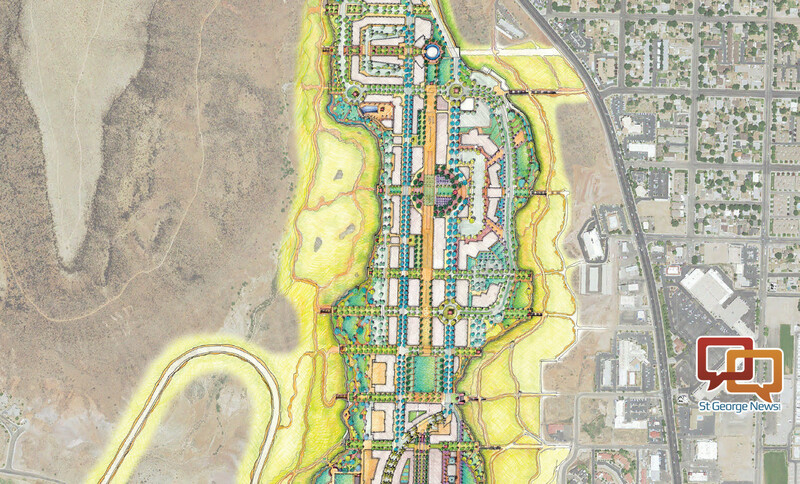 Developers presented the St. George City Council with a proposal of the area in April 2017, and it’s gained traction since and was showcased at the St. George Area Economic Summit last month. The massive master-planned community is slated to feature residences built among commercial centers, schools, recreations facilities and so on. It will take between 25-30 years for the development to reach completion, Pike said. “It’ll be a very attractive place to live, work and play,” he said. Promoted as the site of the city’s incoming technology and business park, the city recently approved a preliminary development plan for the mesa top that once served as the city’s airport. 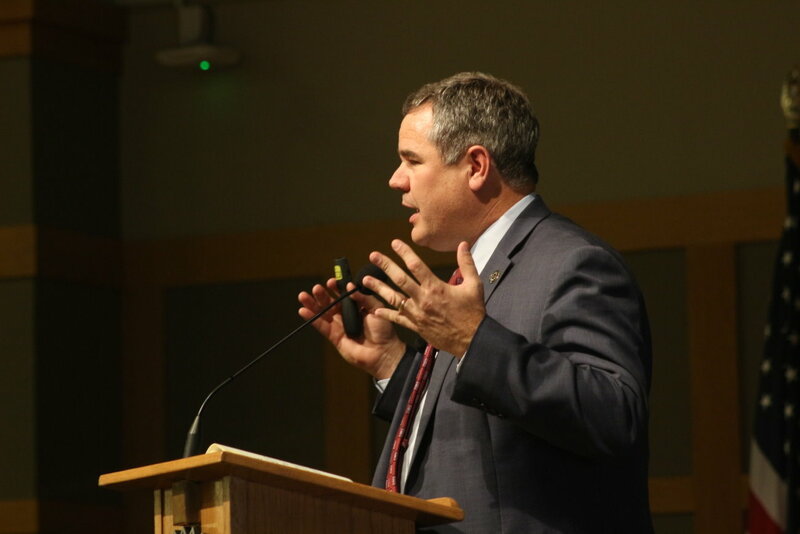 Pike called Tech Ridge an expansion of the city’s downtown that is anticipated to foster the growth of current tech-based companies and promote the creation of news ones in an effort to bring more high-paying jobs to St. George. While the promotion of high-tech companies and jobs is a focus of the project, it will also be surrounded by commercial and high-density residential development as well. “We believe it will provide an opportunity for what we call ‘critical mass’ to be able to keep and attract tech companies here in St. George,” Pike said. “It’s a mess out there and it’s going to be until about November,” Pike said of the Bluff Street road construction. 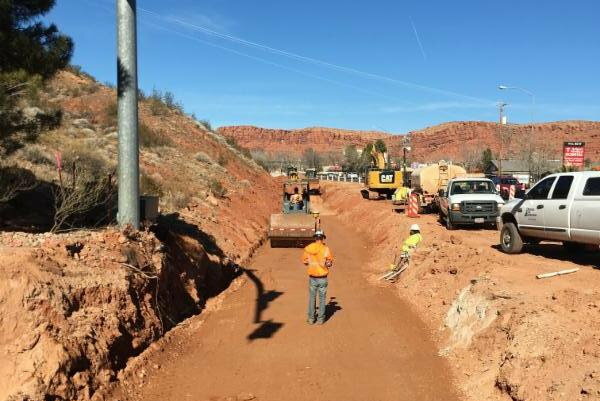 The Utah Department of Transportation is widening the road between its intersections with St. George Boulevard and Sunset Boulevard. The project is touted by state and local road officials as a way to help ease congestion on the increasing-traveled roadway. Due to concerns that businesses along Bluff Street might lose business because they look closed to passersby, Pike said City Council passed an ordinance allowing them businesses to get “creative” with their signage so the public can see they are still open. A fire station in the Little Valley area is still set to be built on Commerce Drive sometime this year. The city completed two large soccer/multi-use sports fields in the Little Valley area. A pedestrian bridge is being built over the Virgin River alongside the River Road bridge. Work continues on the overhaul of Vernon Worthen Park on 400 East. The city is moving to connect its trails to the roads in order to promote the trail system as a mode of transportation and not just for recreation use. SunTran, the city’s public transit service, is getting a new look and four new buses as the current buses are high on mileage. We MUST keep growing like this if were going to afford the water pipeline. Besides what’s 2 or 3 BILLION dollars and California type growth? Drought seems to be returning to the SW. Will there be sufficient water remaining in Lake Powell to even feed the pipeline if it is built? Mayer Pike is a pro-development pro-growth politician, He has very little concern about resident rights and privacy. He has been a poor champion for St. George citizens and so many of their important quality of life concerns! Vote him out. Overcrowding and congestion will become a key problem if this unbridled growth policy continues. at least Mr Pike knows how to spell Mayor ! Nimby’s–I don’t think Pike is your biggest threat to population growth. Utah’s ongoing population explosion is thanks to natural increase/high birth rates. If you’re truly concerned about growth, I’d petition the leaders of the LDS church, who routinely encourage their congregations to have lots and lots of children. You’re damn right about that utahdiablo. Parks and trails are fine but not all the developments – greedy b*stards.